One of America’s most archaeologically and culturally rich yet unprotected areas is experiencing an onslaught of looting, vandalism, and grave robbing. A Native American intertribal coalition—led by the Navajo Nation, the Hopi Tribe, the Ute Mountain Ute Tribe, the Pueblo of Zuni, and the Ute Indian Tribe—has called on President Barack Obama to protect the area as a national monument. The Bears Ears region is a diverse landscape of public lands and Native American cultural and ancestral land located in San Juan County in southeastern Utah. The area is estimated to contain more than 100,000 cultural and archaeological sites in its proposed 1.9 million acre range. Officials estimate that Utah’s San Juan County has more archaeological sites per square mile—roughly 250,000—than any other county in the nation. The Bears Ears Inter-Tribal Coalition has called it the most significant unprotected archaeological area and cultural landscape in the United States. In recent years, the area has become a hotbed for grave robbing, looting, and other destructive activities. While there are underenforced federal and state laws—including the Archaeological Resources Protection Act, or ARPA, and the Native American Graves Protection and Repatriation Act, or NAGPRA—that ban the removal or sale of artifacts from federal lands, Indian reservations, or burial grounds, the area is not specifically protected under national conservation or preservation laws. The Monticello, Utah, field office of the Bureau of Land Management, or BLM, has reported at least 25 incidents of looting, vandalism, and disturbance of human remains in San Juan County since 2011. However, crimes of this nature are historically underreported, and it is likely that other instances remain unknown. The number also does not include incidents on lands managed by the U.S. Forest Service, U.S. Park Service, or Utah School and Institutional Trust Lands Administration. The nonprofit Friends of Cedar Mesa, which has been tracking recent disturbances, conservatively estimates there have been more than 50 incidents during this time frame. The combination of Bears Ears’ vast size, number of archaeological sites, surge in looting incidences, and unprotected status make it the most vulnerable place in the United States for these kinds of activities. Looting, desecration, and vandalism are unfortunately common problems in many areas rich in cultural sites. These practices have long been a regular occurrence in Bears Ears, but according to archaeologists and law enforcement officers who patrol the area, these types of destructive incidents have been on the rise. Navajo archaeologists note that the consideration of looting and grave robbing as a “hobby” or “pastime” is simply a euphemism for destructive, disrespectful, and illegal practices. These activities dishonor Native American history and infringe on the cultural and spiritual identity of Native peoples. They also undermine the integrity of the archaeological record and hamper the ability of archaeologists to understand the past. Archaeologists have found that many looters target burial grounds and graves in order to recover valuable and intact items buried with the dead. Human bones are often cast aside. “This destruction of our sacred sites—including the gravesites of our ancestors—deeply wounds us,” said Regina Lopez-Whiteskunk, councilwoman to the Ute Mountain Ute. “Bears Ears should have been protected long ago. It has been central to our creation and migration stories since time immemorial,” she continued. Vandalism is also a problem. Centuries-old and ancient art is frequently damaged by graffiti or off-road vehicles. Other sites are threatened because they do not appear to be of historic value to the untrained eye since they are hidden under soil or have been damaged from previous disturbances. Many of the sites and artifacts in the Bears Ears region have never been inventoried or studied. The most prominent example of looting in the area comes from a 2009 sting operation directed by the BLM and FBI, which led to the largest investigation of artifacts taken from Native American land in U.S. history. The two-year undercover operation focused on a ring of people in and around San Juan County who had been known to sell artifacts taken from tribal and federal lands. Records from the arrests show that 24 people were indicted under multiple counts each of violations under the ARPA and NAGPRA laws for trafficking in stolen artifacts, theft of government property, and trafficking in Native American cultural items. The case used 256 artifacts valued at $335,685 as direct evidence. However, experts estimate that more than 40,000 artifacts were seized in the operation. None of the accused served jail time, though defendants were required to turn over their collections. Two of the suspects ultimately committed suicide. 2012: Campers tore down a 19th-century Navajo hogan for use as firewood. 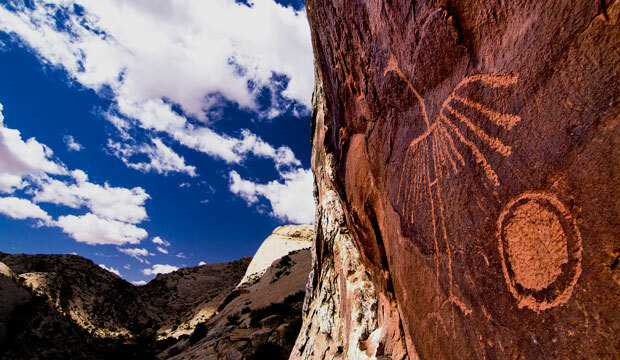 2013: Looters desecrated a burial site in Butler Wash.
2014: A 2,000-year-old pictograph site in Grand Gulch was vandalized. 2015: Three remote burial sites in Cedar Mesa were dug up and looted, and a separate burial site was dug up in Reef Basin. 2015: Prehistoric walls were torn down at the Monarch Cave and Double Stack Ruins on Comb Ridge. In 2014, San Juan County Commissioner Phil Lyman, along with anti-government militia members from the Bundy standoff in Nevada, made headlines with an all-terrain vehicle, or ATV, ride in Recapture Canyon, an area closed off to motorized vehicles to protect known Native American archaeological resources. The anti-federal government protest ride got Lyman a 10-day jail sentence and $1,000 fine. In January, a petroglyph was partially removed from a wall with a rock saw and chisel, badly damaging the ancient rock art. In March, rock art in a cave was vandalized with names scratched into the art. Also in March, a fire ring on Muley Point was constructed out of materials from a 2,000-year-old to 3,000-year-old site. In April, ATV riders intentionally left the trail to drive through two archaeological sites in the lower Fish Creek Canyon Wilderness Study Area. The Antiquities Act was signed into law with the intent of protecting sites and artifacts such as those in Bears Ears. Not only does it make theft or desecration of historic ruins illegal, the 1906 law gives the president power to set aside places and lands for specific protection. Both Republican and Democratic presidents have used the Antiquities Act to protect some of the nation’s most valued sites, including the Grand Canyon, the Statue of Liberty, and numerous Native American cultural sites. In fact, the law originally grew out of a movement to preserve archaeological resources from looting and vandalism in the Four Corners region, an area with large swaths of Native American-owned land where southeastern Utah, southwestern Colorado, northwestern New Mexico, and northeastern Arizona meet. This region includes Bears Ears. Monument protection status for Bears Ears is warranted and could ease the wave of looting and vandalism. 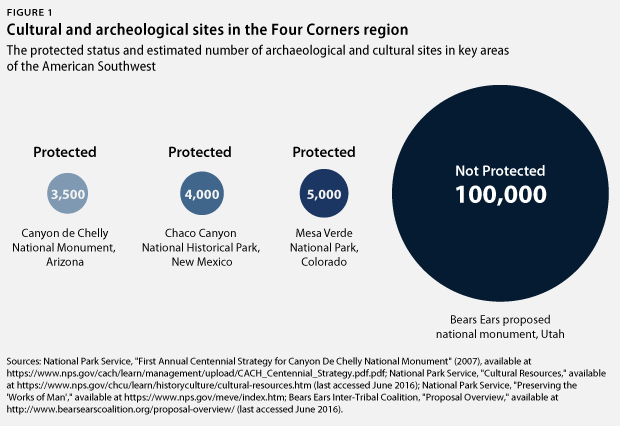 When compared to many of the already-protected cultural areas in the Four Corners region, Bears Ears and its estimated 100,000 cultural and archaeological sites clearly need similar protections. In comparison, Canyon De Chelly National Monument in Arizona contains an estimated 3,500 or more Navajo archaeological resources and landscape sites. Chaco Canyon National Historical Park in New Mexico includes 4,000 prehistoric and historic agrological sites, while Mesa Verde National Park in Colorado protects nearly 5,000 known archaeological sites, including 600 cliff dwellings. With only four federal law enforcement rangers in the region, each patrolling an average of 1 million acres, the BLM does not currently have the resources to monitor the wealth of sites and artifacts in Bears Ears. Granting Bears Ears national monument status would allow increased funding for staff, management, and law enforcement to better patrol the area and increase education and management of the area’s visitors. Rep. Bishop and other members of the congressional anti-parks caucus consistently criticize use of the Antiquities Act, claiming a lack of public buy-in or that use of the act has strayed from its original intent to protect archaeological sites from looting. In the case of Bears Ears, several tribes and 71 percent of Utah voters have declared their support for a national monument that would formally protect one of America’s largest swaths of antiquities from persistent looting and destruction. Jenny Rowland is the Research and Advocacy Associate for the Public Lands Project at Center for American Progress.